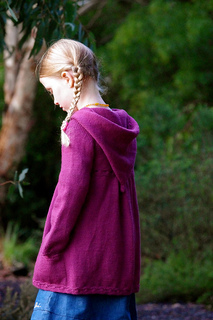 Annabel is every little girl’s dream hoodie. 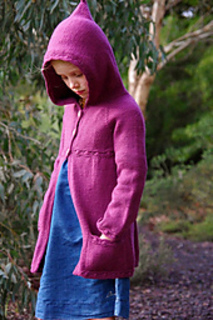 It’s warm and snuggly; designed to be worn as a jacket to ward off those winter chills. 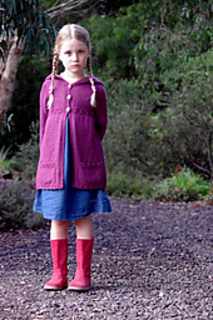 This seamless coat is adorned with daisy stitches on the cuffs, hemline, hood, waistline and those adorable pockets. 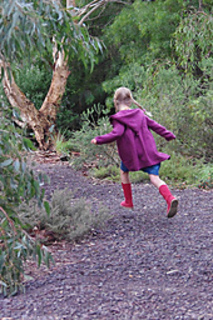 Annabel features subtle back gathers, the sweetest inset pockets and is finished with an optional pixie-style hood. Annabel is knit seamlessly from the top down beginning with the neckline using a raglan construction. The body is knit flat and the sleeves are knit in the round. The neckline stitches are picked up once the body is complete and the hood is knit from there upwards. Stitches are picked up around the hood and along the sides to create the edging and button-bands. Set in pockets are worked in such a way as to create minimal finishing. Tutorial link included for working the daisy stitch. 22-30: 25½/64.5 (26½/67.5, 27¾/70.5, 28¾/73) (30/76, 31/78.5, 32/81, 34¼/87) inches/cms. Designed to fit with 3 to 4¼ inches/7.5 to 11 cms of positive ease. Sample shown in WOOLganics Kundalini. 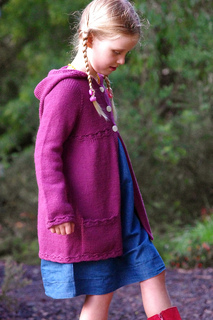 This pattern is also available as a Aran/Heavy Worsted version here. 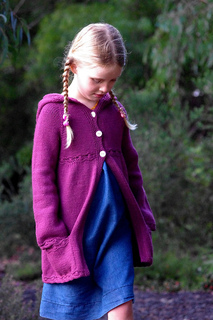 A cardigan version with less ease is also available here: Annie. All three versions are available in the e-book Anne.